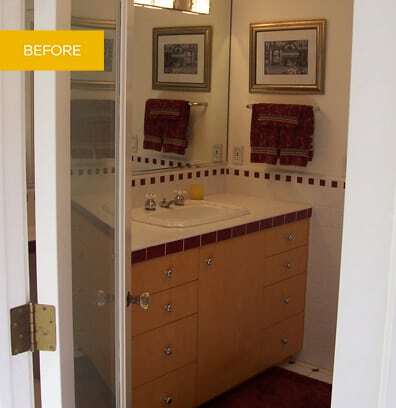 This bathroom in a 100-year old Spanish Revival style home now beautifully serves dual purposes as a bathroom for both pool access and a guest room. The owners needed a room that was practical and easy to maintain for “after the pool” use, while also respecting the carefully planned design aesthetic of their historical home. The first challenge for this remodel was the original design of the home, built in 1926. Two bathrooms were connected in an unusual layout that required substantial restructuring of the space. The bathroom shown here was moved to an exterior wall to allow for easier access to the pool and the addition of a window, providing better ventilation and lighting. Two doors, one leading to the pool and one leading to a guest bedroom, were designed as pocket doors with milky glass to add space and light. 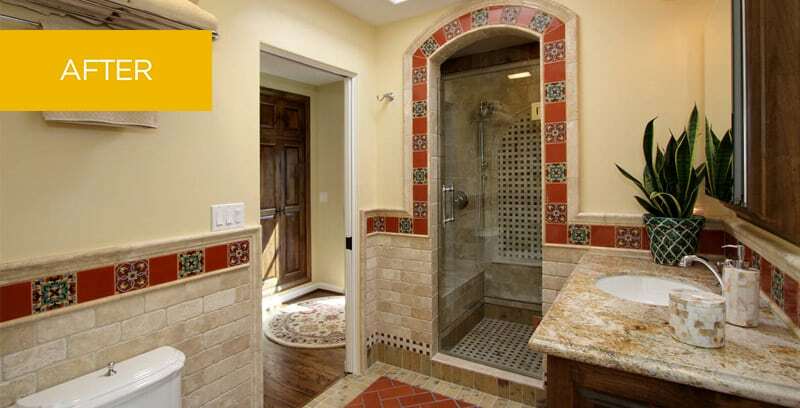 The overall aesthetic of the room expresses the home’s Spanish Revival style with vibrant hand-painted mosaic tiles, a recurring arch theme built into the detailing inside and outside the shower, and an intricate flooring pattern composed of terra cotta and porcelain. Modern luxury is reflected in the oversize shower with its handheld showerhead. The shower’s bench offers a comfortable place from which to appreciate the intricate detailing in the tiled niche and onyx mosaic arch inside the shower or enjoy the surrounding view from the room’s window. The bathroom achieves a harmonious and intriguing balance between modern functionality and respect for the home’s historical nature.